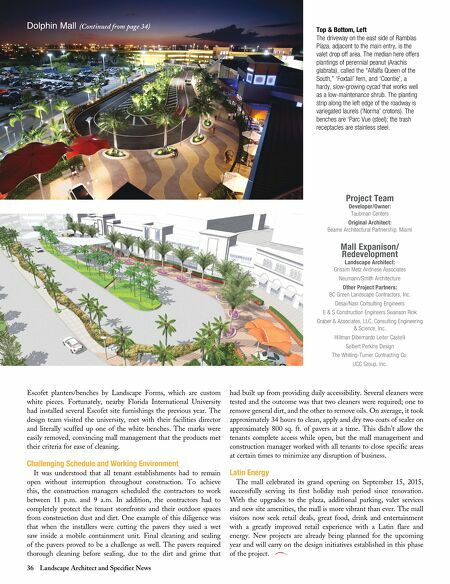 36 Landscape Architect and Specifier News Dolphin Mall (Continued from page 34) Escofet planters/benches by Landscape Forms, which are custom white pieces. Fortunately, nearby Florida International University had installed several Escofet site furnishings the previous year. The design team visited the university, met with their facilities director and literally scuffed up one of the white benches. The marks were easily removed, convincing mall management that the products met their criteria for ease of cleaning. Challenging Schedule and Working Environment It was understood that all tenant establishments had to remain open without interruption throughout construction. To achieve this, the construction managers scheduled the contractors to work between 11 p.m. and 9 a.m. In addition, the contractors had to completely protect the tenant storefronts and their outdoor spaces from construction dust and dirt. One example of this diligence was that when the installers were cutting the pavers they used a wet saw inside a mobile containment unit. Final cleaning and sealing of the pavers proved to be a challenge as well. The pavers required thorough cleaning before sealing, due to the dirt and grime that had built up from providing daily accessibility. Several cleaners were tested and the outcome was that two cleaners were required; one to remove general dirt, and the other to remove oils. 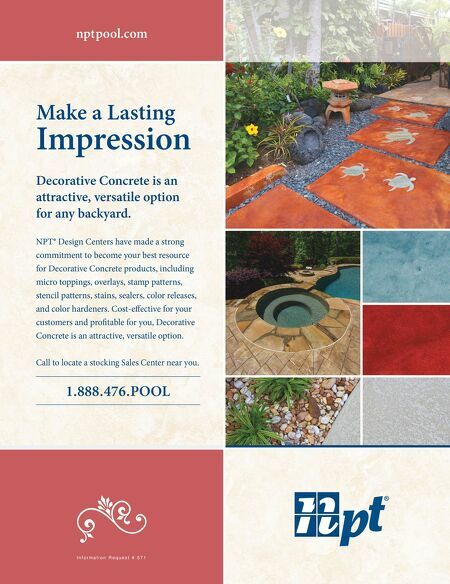 On average, it took approximately 34 hours to clean, apply and dry two coats of sealer on approximately 800 sq. ft. of pavers at a time. This didn't allow the tenants complete access while open, but the mall management and construction manager worked with all tenants to close specific areas at certain times to minimize any disruption of business. Latin Energy The mall celebrated its grand opening on September 15, 2015, successfully serving its first holiday rush period since renovation. With the upgrades to the plaza, additional parking, valet services and new site amenities, the mall is more vibrant than ever. The mall visitors now seek retail deals, great food, drink and entertainment with a greatly improved retail experience with a Latin flare and energy. New projects are already being planned for the upcoming year and will carry on the design initiatives established in this phase of the project. Top & Bottom, Left The driveway on the east side of Ramblas Plaza, adjacent to the main entry, is the valet drop off area. The median here offers plantings of perennial peanut (Arachis glabrata), called the "Alfalfa Queen of the South," 'Foxtail' fern, and 'Coontie', a hardy, slow-growing cycad that works well as a low-maintenance shrub. The planting strip along the left edge of the roadway is variegated laurels ('Norma' crotons). The benches are 'Parc Vue (steel); the trash receptacles are stainless steel. Project Team Developer/Owner: Taubman Centers Original Architect: Beame Architectural Partnership, Miami Mall Expanison/ Redevelopment Landscape Architect: Grissim Metz Andriese Associates Neumann/Smith Architecture Other Project Partners: BC Green Landscape Contractors, Inc. Desai/Nasr Consulting Engineers E & S Construction Engineers Swanson Rink Graber & Associates, LLC, Consulting Engineering & Science, Inc. Hillman Dibernardo Leiter Castelli Selbert Perkins Design The Whiting-Turner Contracting Co. UCC Group, Inc.